To spread their spores and make more creepers, of course! With this mod, creepers no longer spawn out of thin air. They actually grow from Creeper Plants, which can be found throughout the world. All creeper explosions now spread Creeper Spores. Any Creeper Spore that lands on grass or dirt will grow into an entirely new Creeper Plant. Don't want creepers wandering around? Better dig up all those Creeper Plants! This mod will be compatible with the 1.12+ TerraFirmaCraft port if/when it is ever released. It will probably not work with any other mod that replaces Vanilla grass/dirt blocks. 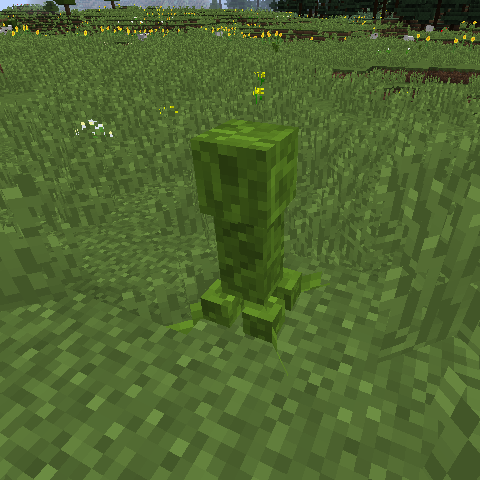 Any mod that has its own creeper variants should continue to function as normal. I'm releasing this under the MIT License, so you can do pretty much whatever you want with this mod as long as you're not a jerk about it. You want to put it into a ModPack? Go right ahead. You want to backport the mod to Minecraft v1.2.1? That's a little weird, but you do you. It actually does work with non-vanilla dirt, interestingly enough. I love how unique this mod is. Thanks, I'm so glad this mod is getting such a positive response! Creepers are definitely not supposed to spawn at night anymore. I liked the idea that you could make an area relatively safe from creepers if you cleared all of the Creeper Plants, though if it's something people want I can add a config option to allow vanilla creeper spawning again. You were inspired Game Theories? Lol that's one of the crappiest versions of Minecraft ever. Really fun mod! This looks cool, would love to see some screenshots added to this page though.